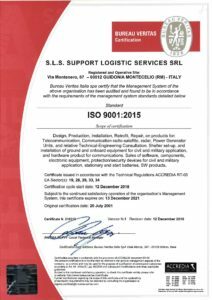 SLS Support Logistic Services Srl holds individual and collective security certificate and is equipped with a secure working and storage area for classified files and parts. Our quality system is certified to comply with ISO 9001:2015 and ISO 14001:2004. Moreover we are qualified by Italian Air Force with the certification AER-Q-2120 (AQAP-2120) and we are registered to NATO / NAMSA / NSPA (N/CAGE CODE: A0792).